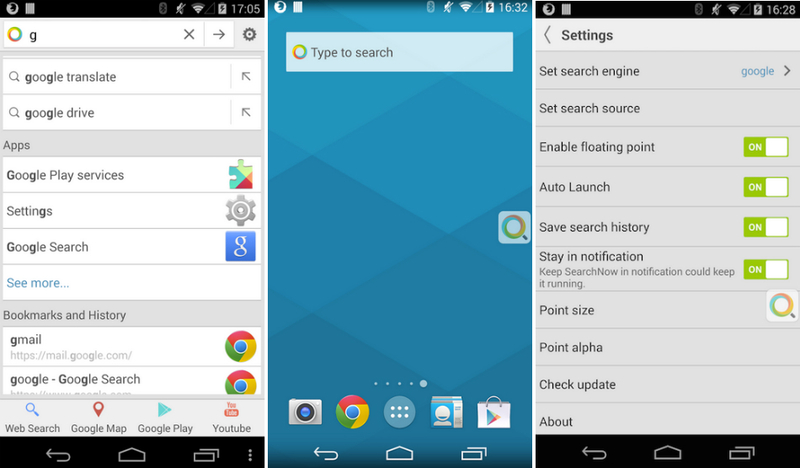 A new app called Search Now recently hit Google Play for Android devices. For anyone who has wished the built-in search function on Android was a bit more comprehensive, this may be the app for you. With it, users can search for pretty much anything that is on their device or even on the web thanks to built-in browser tools. For example, if I want to search for a picture, I can search by a folder name or a specific file name. If I want to search by a bookmark that I have on Chrome, I can do that as well. Search Now also allows for users to use different search tools, too – instead of Google, you can select Yahoo, Bing, Ask, or from many others. Users can search through contacts, the web, applications, bookmarks, web history, music, videos, calendar items, and even system settings. It is quite extensive. You can choose to have a movable little widget placed on your home screen or a full bar widget, whichever you prefer. The app is completely free, so go check it out on Google Play.